On these pages, I will introduce a control circuit for stepper motor. The software of this project is adapted to Embedded Systems(Lab13) for 2002 of Cleveland State University. On this page, I will explain about the operation principle of stepper motor. There are many kind of stepper motors. Unipolar type, Bipolar type, Single-phase type, Multi-phase type... Single-phase stepper motor is often used for quartz watch. On this page, I will explain the operation principle of the 2-phase unipolar PM type stepper motor. In the PM type stepper motor, a permanent magnet is used for rotor and coils are put on stator. The stepper motor model which has 4-poles is shown in the figure on the left. In case of this motor, step angle of the rotor is 90 degrees. As for four poles, the top and the bottom and either side are a pair. coil, coil and coil, coil correspond respectively. For example, coil and coil are put to the upper and lower pole. coil and coil are rolled up for the direction of the pole to become opposite when applying an electric current to the coil and applying an electric current to the coil. It is similar about and , too. The turn of the motor is controlled by the electric current which pours into , , and . The rotor rotational speed and the direction of the turn can be controlled by this control. , , and are controlled in the following order. You can find by the figure, the rotor is stable in the middle of 2 poles of stator. When one side of the stator polarity is changed, the bounce by the magnetism occurs. As a result, the direction of rotor's turn is fixed. The characteristic of stepper motor is the angle can be correctly controlled and to be stable rotates ( It is due to the reliability of the control signal ). Moreover, because the rotor is fixed by the magnetism in the stationary condition as shown in the principle, the stationary power(Stationary torque) is large. It suits the use to make stop at some angle. The motor which was used this time is 48 steps and the step angle is 7.5 degrees. The way of controlling is the same as the previous example completely. It operates when controlling the electric current of coil, coil, coil and coil. The case of the clockwise control is shown below. The combination of , , and repeats four patterns. Pink line shows the external parts. This is the circuit which drives the coil of stepper motor. There are circuits which drive coil, coil, coil and coil respectively. Darlington connection-type transistor is used for the drive of the coil. As for the Darlington connection, 2 stages of transistors are connected inside in series. The "hfe" of this transistor is the multiplication of the "hfe" of each transistor inside. In case of 2SD1209K which was used this time, the hfe is over 4000. Because the ratio of the input electric current and the output current is big, the rising edge and the falling edge of the control signal can be made sharp. The diode to be putting between the collector and the power is for the protection of the transistor. When the transistor becomes OFF from ON, the coil of the motor tries to continue to pass an electric current and generates high voltage. An electric current by this voltage is applied to the diode and the high voltage which applies over the transistor is prevented. This is the circuit which controls the rotational speed of the motor. TR1 becomes ON condition when RB7 becomes H level. In this condition, the electric charge of capacitor C1 flows through the transistor and the voltage of the both edges of the capacitor becomes 0 V almost. When RB7 becomes an L level, the transistor becomes OFF condition. In this condition, the electric current flows through VR1 and R4 into capacitor C1 and the charging to the capacitor begins. The voltage of the both edges of the capacitor becomes high gradually as charging is done. As for the change of this voltage, refer to "Integration circuit". The voltage of the capacitor is detected by RB5. The software of PIC interrupts the control of the motor until it checks RB5 after making RB7 an L level and RB5 becomes H level. When making the value of VR1 small, the charging time of the capacitor is short and the control of the motor becomes quick. The control of the motor becomes slow when making VR1 big. The speed control range can be changed by changing the value of the capacitor. This is the circuit for the clockwise rotating, the counterclockwise rotating or stopping a motor. The baton switch of the non lock is used. Pull-up resistor is used for the port to become H level when the switch is OFF. The RB port of PIC16F84A has an internal pull up feature. However, because RB5 is used for the voltage detection of the capacitor at the circuit this time, an internal pull up feature isn't used. If using RA port for the voltage detection of the capacitor, the RB internal pull up feature can be used. The circuit this time put an external pull-up resistor in the relation of the pattern. 4-MHz resonator is used because the circuit this time doesn't need high-speed operation. The purpose of this circuit is to keep power supply voltage to PIC to 5V when the power of the stepper motor is more than 5V. 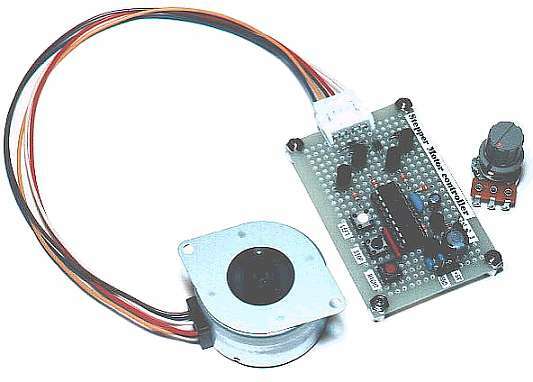 Because the operating voltage of the stepper motor to be using this time is about 5V, the power supply voltage is +5V. In this case, the voltage which is applied to PIC becomes less than 5V because of the voltage drop (about 1V) of the regulator. In case of PIC16F84A, the operation is possible even if the power falls to about 3V because the operating voltage range is from 2V to 5.5V. It is enough in the 100-mA type. btfsc   portb,rb5       ;RB5 = 0 ? btfsc   portb,rb1       ;RB1(stop key) = ON ? btfsc   portb,rb2       ;RB2(right key) = ON ? btfsc   portb,rb0       ;RB0(left key) = ON ? decfsz  count1,f        ;count - 1 = 0 ? btfss   portb,rb5       ;RB5 = 1 ? decfsz  count2,f        ;count - 1 = 0 ? 0012   1A86           00047         BTFSC   PORTB,RB5       ;RB5 = 0 ? 0014   1886           00052         BTFSC   PORTB,RB1       ;RB1(stop key) = ON ? 0018   1906           00057         BTFSC   PORTB,RB2       ;RB2(right key) = ON ? 001D   1806           00063         BTFSC   PORTB,RB0       ;RB0(left key) = ON ? 0025   1A86           00073         BTFSC   PORTB,RB5       ;RB5 = 0 ? 002A   0B8D           00078         DECFSZ  COUNT1,F        ;count - 1 = 0 ? 002D   1E86           00081         BTFSS   PORTB,RB5       ;RB5 = 1 ? 0034   3C01           00087         SUBLW   D'1'            ;Right ? 0040   3C01           00100         SUBLW   D'1'            ;Right ? 004C   3C01           00113         SUBLW   D'1'            ;Right ? 0058   3C01           00126         SUBLW   D'1'            ;Right ? 0066   0B8E           00147         DECFSZ  COUNT2,F        ;count - 1 = 0 ? Label list has been deleted. All other memory blocks unused.